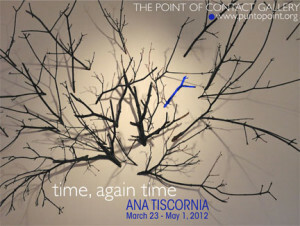 The Point of Contact Gallery features several exhibitions per academic year. This page documents our past exhibitions for interested visitors as well as the digital catalogues that accompany them. Dream Bird, Hatching the Egg includes works that explore the interconnection between Buddhist philosophy, meditation, and the creative process. Stainman’s work creates a visual metaphor of her personal experience with sensuality and color. The tactility of her work draws the viewer in through the body as a means of manipulation, lulling them into mental relaxation and an experience of natural mind. Chilindron’s works range from the geometrically abstract to the organic and the environmental. While at first glance these aesthetic styles appear to be seemingly contradictory, this exhibition aims to highlight the common ground—the Point of Contact—where the works’ shared formal elements emerge. photographed for a prototype of the project. She has relaunched Look Now as a photography exhibition and multimedia installation with a new collaborative team. Cindy Bell, also a breast cancer survivor, is the project photographer. In 2018-19, Look Now focuses on the personal stories of survivors from Central New York. Interactive text, graphics, mirrors, and an experimental film enhance the exhibition’s visual core, which presents 44 participants—25 with clothed photographic portraits and images of bare chests, and 19 who have chosen to remain anonymous except for their bare-chest close-ups. Look Now is part of Syracuse University’s Syracuse Symposium, whose theme in 2018-19 is Stories, an exploration of how we tell them and what effects whose stories we hear. Featuring works by Salvador Dalí, Mauricio Lasansky, Joseph Kugielsky, Adàl Maldonado, Pedro Roth, and more. This exhibition is a collaborative project between Community Folk Art Center, Light Work, Point of Contact Gallery, and Syracuse University Art Galleries. Curated by Point of Contact’s Assistant Director and Art History graduate student, Natalie McGrath, with exhibition design consultation from Professor Juan Juarez of Syracuse University’s College of Visual and Performing Arts. featuring the work of six M.F.A. candidates from Syracuse University’s VPA School of Art, and Department of Transmedia. Exhibiting artists include Eric Charlton, Joan Farrenkopf, Marilyn Koch, Jo Yu Lee, Katie Levesque and Luxin Zhang. Hiding in Plain Sight is curated by Shehab Awad, curator of exhibitions and programs at the Institute of Arab and Islamic Art, New York City. 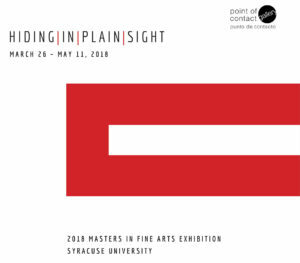 Featuring a diverse array of paintings, sculptures, video and installations, “Hiding in Plain Sight” represents the culmination of a three-year period of critical investigation and introspection, marked by a significant, self-led shift toward multidisciplinary experimentation. The result is a collection of works which, through their staging and materiality, radicalize traditional modes of art-making and subvert our perception of space and reality. 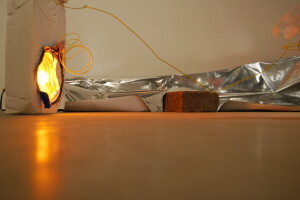 Soft White is comprised of five large and six small wall based pieces of mixed media, most notably incorporating lace fabric, paint, foam and lighting. Together the work forms a dialogue referencing the applied and fine arts, natural phenomena, domesticity, time, ritual, geography and emotional condition. Andrew Havenhand is currently Painting Coordinator for the Studio Arts program in the School of Art at Syracuse University. Havenhand’s work has been exhibited throughout the United States and internationally. Most recently in ‘ Pink Slip ‘, Leeds, England and ‘ White to Cream to Pale ‘, in Florence, Italy. From the United Kingdom to the 2017 Venice Biennale, a collective of international contemporary artists bring a new exhibition to Point of Contact Gallery and Syracuse University. Boîte-en-Valise encourages transportability of practice, the nurturing of collaboration and cross-fertilization of artistic practice. For Boîte-en-Valise: Generate artists worked with individuals and communities in Portsmouth and Syracuse to develop the work. 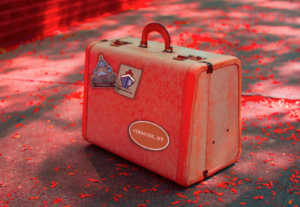 Each artist is transporting the means to generate their work at Point of Contact Gallery, begun by working with people and places over several days in Syracuse, in a normal sized suitcase. To be transported as luggage on a normal flight, train or bus journey and taken from the suitcase for presentation without any fixing to walls, floors and/or ceilings of the venues. These six artists bring together works including sculpture, performance, video, photography and sound as well as interventions and conversations. “Before, we were the Aleph, now we are transporters of the Aleph. We became dependent, enslaved by this invention. We talk about virus, viralize. We talk about it as if it were a symptom. Something that is out there, from which we are contaminated. We trust our memory to it, our knowing. We fear something may happen to it. Corpus is an exhibition that examines the themes of decay and nothingness through a multi-media installation. A neglected residence becomes a symbolic metaphor for the gradual decay of the body and mind over time. While videos and photographs portray the inability to capture nothingness by mapping its ambiguous state through demarcation and indexing. Both themes explore the human desire to leave tangible remains, which creates the ambiance of physical existence. Juarez compares the deterioration of mind and body through aging to the neglect and ruin decay of the structural integrity of a home. As our bodies age, our homes do at a similar rate of decay. Both experiences of home encompass both a physical and an emotional presence. The more things there are in the world, the more gaps that exist between them, the less we understand. Those who continue to look at something and begin to notice more and more lose the definition of the whole. Art objects, especially paintings, take on a contemplative quality almost immediately. Sometimes they fade into the obscurity of other images, but this interplay between vaguery and knowable is what injects vitality. The art objects and paintings in this show push and pull obfuscation in many directions. The topics addressed in the show run the gamut from deeper focus to light daydream and will play on every viewer’s confidence of what is seen. Each artist is not showing us the world as it is, they show us their reality, they contemplate with us. The impenetrable, hidden, indistinct, dark, ephemeral, unknown, transmundane, and vague understanding we have of each work is the artist asking the work for answers. Continuum is an exhibition that celebrates 40 Years of Point of Contact Gallery, its journey, and does so through the lens of its permanent art collection. Many of the pieces included in the exhibition have been created specifically for Point of Contact publications and exhibitions and provide a unique perspective on the evolution of the organization. The selection of works shown in the Continuum exhibition include artists from Argentina, Brazil, Cuba, England, Germany, Israel, South Korea, Puerto Rico, Russia, the Unites States, and Uruguay. By revisiting its past, Point of Contact also looks toward its future, refining its vision and turning each new encounter into an experimentation with unlimited insights. within walls is an exhibition of new work by Karin Waisman. This body of work reflects upon the natural process of growth and decay. Each piece, made out of many cast or modeled fragments, is the outcome of the process of making it. The wall, no longer flat, becomes the concrete support of the work. A mural like quality of the pieces transforms the wall into a tactile and intricate sensuous surface. Ornament and wall become a metaphor for a time caught between permanence and evanescence. 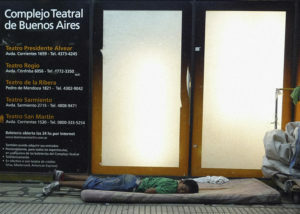 WOE: Globalized Sadness is an exhibition by Argentine artist Juan Cavallero that explores the borderless nature of human desperation and poverty. In this exhibition, Cavallero uses both photography and video to compel viewers to confront uncomfortable situations that are often ignored. By doing so, Cavallero aims to give back identify to countless individuals from around the world that have become invisible and forgotten. The Blue of Ruins features Roche’s “blue” paintings and drawings made between 2007 and 2016 that use techniques such as brush drawing, scraping and rubbing on the material’s surface to explore what is left of the subject. Concerning his process, artist Roche states “I’m trying to see what I cannot see, by looking with my hands.” Many of the works included are still-lifes and the self-portraits, allowing Roche to comment on both the wholesomeness of the artist as subject and his relationship with memory and the world of objects. Mind and body, object and subject, art and nature come to a crisis of form in works that portray an exploded body, a denatured nature, and artworks about to come apart. Chilean artist Catalina Schliebener presents a site-specific installation show, Pin the Tail, working with icons related to youth that implicitly reveal norms associated with the construction of gender, identity, and class. In Pin the Tail, she analyzes and deconstructs the normative character and functionality of the game Pin the Tail on the Donkey. By doing so, Schliebener calls into question the nature of these objects, practicing new discourses in which they are not dependent upon the system that produced them. Such children’s games involve a subtle normative character through which children indirectly learn rules of behavior, socialize, and acquire specific roles that will later be reproduced in the adult world. CONTINUUM tells the story of Point of Contact’s journey over the last 40 years through the lens of its permanent art collection. Many of the pieces included in the exhibition have been created specifically for Point of Contact publications and exhibitions and provide a unique perspective on the evolution of the organization. Including artists such as Judy Pfaff, Nam June Paik, Liliana Porter, and Gregory Crewdson, the collection tends to blur visual and verbal, geographic and cross-cultural boundaries, evolving year-after-year, advancing an essential discussion about contemporary art. By revisiting its past, Point of Contact looks toward its future, refining its vision and turning each new encounter into an experimentation with unlimited insights. In this exhibition, Liene Bosquê focuses on the history of vernacular as well as iconic architecture of small and big cities. In reinterpreting symbolic constructions into miniature sculptures that allude to travel souvenirs, the artist tackles not only concepts of collection, but also notions of personal and collective memories. Bosquê is interested in the meanings that human beings attach to places and objects, and how such experiences can serve as catalysts to alter public perspectives, inserting them into private domains. Printmaking for the majority of its history has been a venue to communicate information to a massive audience. As new media outlets—such as the Internet and social media—dissipate the need for printed media, printmaking has found it a necessity and an opportunity to reevaluate its purpose as a medium. A Long History Cut Short includes artwork produced by 9 multi-disciplinary students and faculty in the Department of Printmaking at Syracuse University who explore the boundaries of what is and can be considered “print” in both traditional and non-traditional approaches. 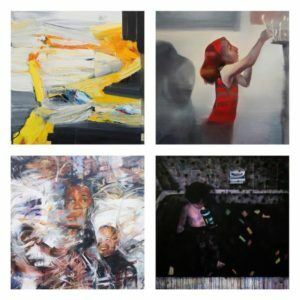 Exhibiting Artists: Paul Dresden, Brent Erickson, Shorty Greene, Kevin Larmon, Jane McCurn, Landon Perkins, Eli Show, Taro Takizawa, and Stefan Zoller. Gwenn Thomas’ photographs of doors and windows are embedded within sculptural frames in ways that question perceptions of photographic imagery, and our experience of lived space. Her photographs of window frames, exterior and interior architectural spaces initiate portholes into the spaces within. These irregularly shaped photographic objects construct the illusion of actual windows, recalling Marcel Duchamp’s window of 1920. The illusion is assisted by the absence of glass in the framing, opening the window of the photo from the perspective of the viewer. The photograph with the frame are the windows themselves. The dual meaning of the word “last” is the genesis of the work displayed in this exhibition. Through mixed media installations, Dorene Quinn calls her audience into action to make this “last”, to remain. An exhibition featuring young talents from Syracuse, NY including photography, video art, and performance. Learning to See consists of work produced in EL PUNTO Art Studio 2014, an interdisciplinary arts program designed by Point of Contact. This innovative contemporary arts program is facilitated to local youths in close collaboration with local Latino artists and community organizations including La Casita Cultural Center, The Spanish Action League of Upstate NY, the Near West Side Initiative, and the Pal Project. This program is supported by Syracuse University’s College of Arts and Sciences and the New York Council on the Arts (NYSCA). Sharply into a Light Space is an exhibition that deals with themes of climate change and the future of our natural environment in a series of photographs, two videos, and an installation. Comprised of both a site-specific installation and large scale video projection, this exhibition navigates the porous boundaries between art, design and architecture intertwining the conceptual, aesthetic and functional nature of the objects that compose the everyday scenarios we live in. Tango is a 21-piece grand-format folio published by Iris Editions in New York (1991); a collaborative work that includes eight intaglios by the late Nancy Graves and thirteen pages of text by Pedro Cuperman, which gaze at the aesthetics of this Latin American dance. The use of the word crossings as the title of our exhibition at Point of Contact is a multi-folded one. It points to journeys and intersections, dealing with time and space, but we are also in its broader and more complex nature, related crossbreeding, gender-crossing, and other hybrid, interdisciplinary modes. It also alludes to sites of convergence between our artistic practices. For years, we have considered the many ways in which our works related to each other, whether dealing with location, mapping, identity, memory, or multiplicity. This exhibition gives us the opportunity to further examine those connections, and to collaborate, for the first time, in the production of new works. This exhibition presents a series of thirteen works on paper, and a two-channel video installation titled PLEXUS13NP. The Point of Contact Gallery presents Meditation on Video (&) Language, a selection of new work on video and a series of drawings by artist Tom Sherman. The exhibit also presents a retrospective of Sherman’s work. The Point of Contact Gallery presents the first solo show by Cuban-born, Syracuse-based artist Oscar Garcés, as part of The Other New York: TONY 2012, a community wide biennial exhibition that is the result of a major collaboration among 14 venues in Syracuse. An activist and renowned Latin American artist, Ana Tiscornia brings to Syracuse a mixed media installation that curator Pedro Cuperman describes as “the outcome of a tale, where we have a fragmented world, where the pieces are somehow geometrically organic, logical… a kind of architecture of catastrophe. It is about the artist’s obsession with organizing her world after having lived through the tragedies of military dictatorships in her home land, and the present catastrophes, wars that we endure in our own time. Ana’s work demands from the viewer a sort of reconstruction, reintegration of the work, and our world. As an installation artist, Horowitz surrounds his audience by manipulating the space around them. To create Constrain/Contain, Horowitz began by collecting trunks, cases and boxes. Though most bore a patina of age, use and neglect, he cleaned, fixed, and elevated each piece with care and respect. The re visions project examines three artistic practices, all in conversation with image and text. Collecting, processing, drafting…and when are you done? Mexican-born, New York City-based artists Gabriela Alva C. and Natalia Porter will present their work with guest Andrew Witkin at the Point of Contact Gallery this fall. 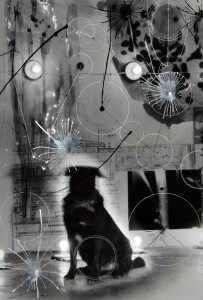 The show will feature the work of Alva and Porter in response to the structure of Witkin’s writings. The Point of Contact Gallery opened its space to Syracuse University Sculpture students. Point of Contact Gallery presents the first exhibition by EL PUNTO ART STUDIO, a mural collage created by young artists and writers from our local community. EL PUNTO is a new contemporary arts program created by Point of Contact as an exploration in the visual and verbal arts. The program is offered in collaboration with the Spanish Action League (La Liga), and La Casita Cultural Center. Video artist Jaime Davidovich returns to Syracuse University after a year of grand-scale museum exhibitions worldwide, to install a show at The Point of Contact Gallery. Davidovich will present a series of his classic videos along with collage, photography, and paintings that he will produce on site. Spanglish is a project made specifically for the Point of Contact Gallery by New York City artist Celeste Fichter, based on Point of Contact’s work in the verbal and the visual arts, and its ties to the Latin American literary and visual arts. 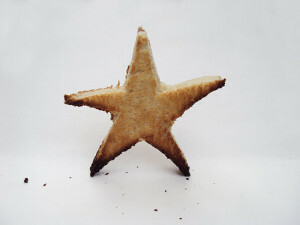 Comprised of drawing, collage, photography and video, Spanglish is based solely on the artist’s understanding and misunderstanding of the Spanish language. An exhibition inspired by the life of Alejandra Pizarnik, one of Argentina’s most adored poets. 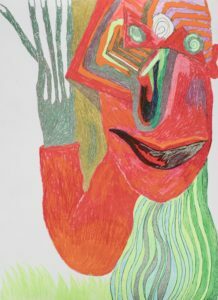 Following two superbly triumphant solo exhibitions at Buenos Aires’ Sivori Museum and the Recoleta Cultural Center, Roth returns to Syracuse for this rich display of drawings that evolves from the work he presented in Argentina earlier in 2009. Roth invents a world of multiple figures drawn to life in a Buenos Aires cafe while listening to a dear friend telling stories about lost loves, departed pets, and friends. Uruguayan-born, New Paltz-based Marco Maggi is best known for his use of everyday materials on which he inscribes a vocabulary that evokes Aztec culture and the art of Joaquin Torres-Garcia. 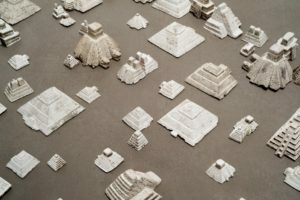 By focusing on visual codes (such as repeated visual symbols that only suggest objects), spatially, and the political connotations of maps, Maggi’s work also reflects Latin American traditions and concerns expressed by many contemporary artists. Ricardo Lanzarini comes from Montevideo to Syracuse, to recreate the mundane and the extraordinary in his drawings made to unexpected scales. Lanzarini’s work balances extremes of scale, crafting an extensive abstract image from precise, miniscule characters, whose everyday activities serve as a window to a miniature world, frozen in time. 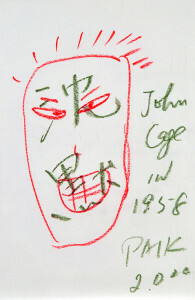 Paik & Cage is an exhibition consisting of the works of Nam June Paik and John Cage. “To write about Nam June Paik and John Cage we run the risk of not saying the right things. And more so when it is about art. So let’s talk about friendship, a friendship accompanied by all the telltales of art’s insights.”- Pedro Cuperman, curator. A life-size maze of mirrors and dreams reveals an exceptional collection of works by Swietlan Nicholas Kraczyna: a fugue-like series of 25 drawings and etching inspired by the Borgian notion of the labyrinth, with Icarus as protagonist. Twenty-three 7ft tall mirrored panels form this massive installation that complicated and multiplies the space of the gallery, and infilitrates the observer. Korean-born avant-garde artist and composer, Nam June Paik, pioneered video as an art form in the 1960s by combining multiple TV screens with sculpture, music and live performers. Trained in music, aesthetics and philosophy, he was a member of the 1960s art movement Fluxus, which was in part inspired by composer John Cage’s use of everyday sounds in music. Paik always remained true to his Fluxus-inspired critical position. He died in February 2006. To view more past catalogues click here.